Should You Use Records Storage or Document Scanning? When you’re deciding if your business should switch to document scanning or stay with records storage, there are a lot of things to consider. You want to be able to get your hands on the documents you need easily, but you also want to find the most cost efficient method in keeping track of everything. 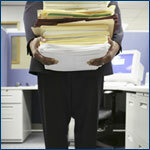 Many companies store their documents in the belief that it is less expensive than having them scanned. In actuality, electronic storage saves big in the long run – in both time and money. The actual cost of storing documents will vary from business to business. However, for businesses that use off-site storage, the cost of transporting documents back and forth has to be factored into the monthly cost. Don’t forget the time lost in the transfer or the time spent in finding the proper documents in your dozens of in-house filing cabinets. Every minute you spend searching for a document is a minute you could spend doing something more productive. If your business produces a large amount of papers you are not currently scanning, storing and re-filing and retrieving these documents can climb fairly high quickly. On the other hand, while scanning documents for electronic storage comes with a price tag, the cost is known up front- and the benefits are massive. You’ll be able to access your documents from your computer in mere seconds. How much time, and therefore payroll, will you save? Many document scanning businesses charge on a per page basis, but even this cost can vary per company based on how many pages your business has scanned on an annual basis. Another consideration is that of customer satisfaction. With an electronic storage system, you’ll be able to handle your customer’s needs and requests quicker, which will result in a higher level of customer satisfaction. It will also save time on your end, which results in even more money saved. Small businesses that don’t produce a large amount of paperwork might find it beneficial to continue to store their documents. For most businesses – scanning and electronic storage will almost always win out on a financial level. It’s critical to think about the long term benefits and cost of how you store your documents before deciding which choice is right for your business. It might not be as black and white as you think. Get Free, No-Hassle Quotes Today! From Document Scanning to Records Storage, our experts will help you select a customized Document Management Solution that fits exactly what you’re looking to do for your company. We have locations all across the United States to serve your needs. Fill out the form to the right, or give us a call at (866) 385-3706. Within minutes of receiving your request, you will have free quotes from experts in your area that can help you. If you’d like to learn more about document management, visit our articles section or check out our blog!